Neither getting out of Kathmandu nor getting into Tibet is easy. 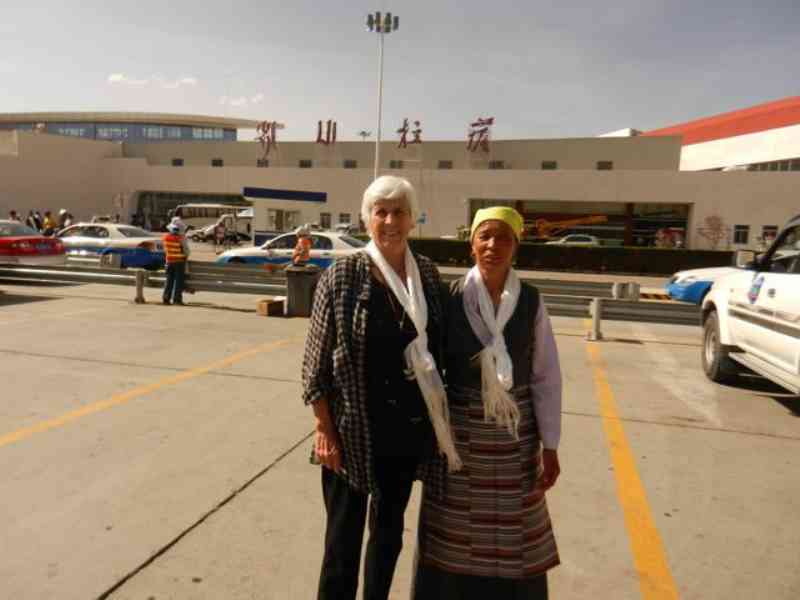 We were honored to receive a Chinese visa for visiting Tibet although it was not issued til two days before our planned departure and we got the last four seats on Air China's one flight to Tibet. Many are turned down and the rules change one day from the other. After a two hour delay, (this is where my needlepointing comes in handy) we walked up the steps of Air China and crammed in the back of the plane with Russians, Germans, and other tourists. There was a deja vu for me as I remember my first encounter with China when I was in Ghana in 1962 and saw a real Chinese Embassy from the street. I was told if I dared step over the line, I would violate international law and the government would have to bargain to get me free. But then in 1972 we entertained the first ever Chinese Ping Pong Team when it was invited to the States by then President Richard Nixon in a travel exchange. The entire entourage of people, security and press (300) arrived at the farm in a split second and we fed them barbecue and chocolate chip cookies and gifted them Frisbees. Photos of this moment of relaxation for the group went all over the world. 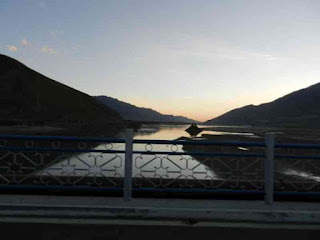 Now I was crossing over into Tibet, China's Tibet. 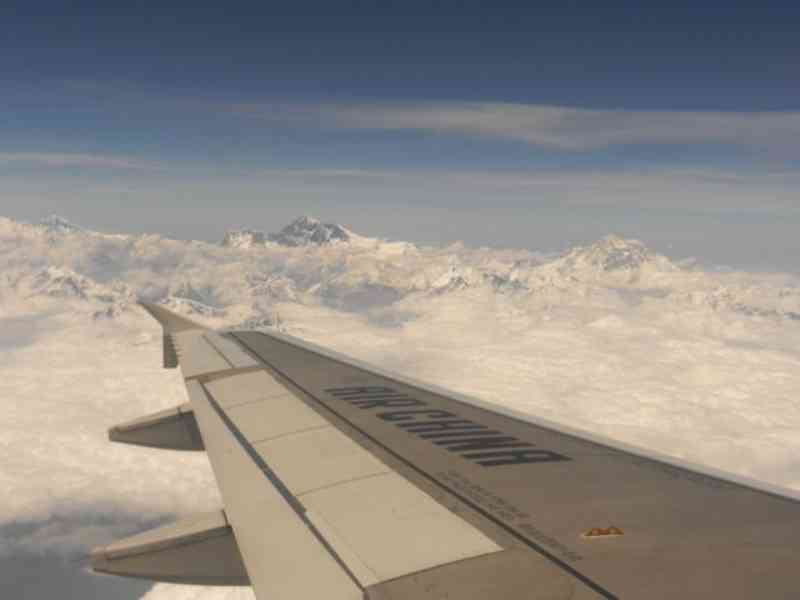 All of us shared in a most extraordinary flight - hugging up next to the Himalayan mountains, waving at a black Mt. Everest striped with snow and other of the tallest mountains in the world which obsess climbers. Quickly on the hour flight, we left the green and clouds of Nepal to enter the brown dry field of mountains, stark and dramatic, which make up Tibet. 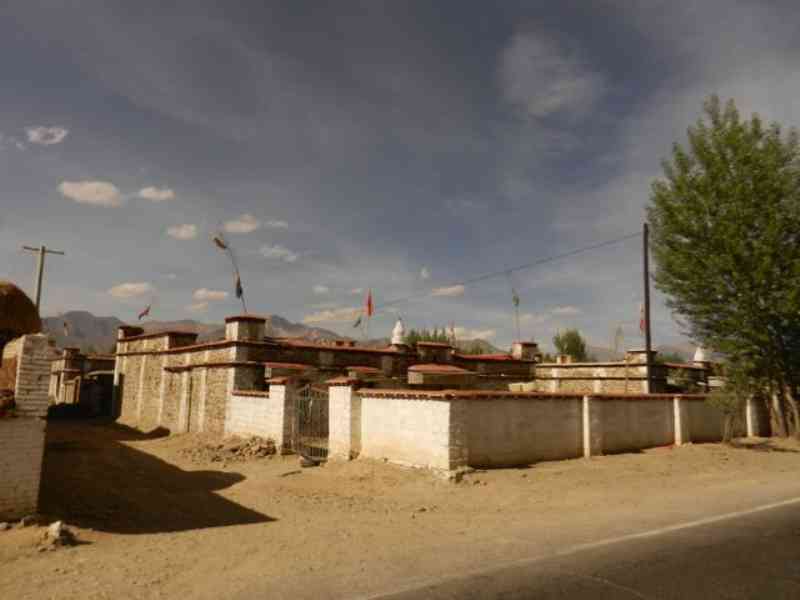 where the Samye Monastery is. The flight pattern followed the valley along the Yarlong River (means Horse) the largest River in Tibet which starts at Mt. Kailash and has such intriguing tributaries named Elephant (that goes into India), Peacock (named Purran and crosses into Nepal), Snow Lion (the Indus which flows into Pakistan) and of course the Horse that wanders through Tibet. It's not a Mississippi style river, huge and flowing along banks, this one is shallow and with a plethora of veins wandering along lethargically. Not for boating. We landed at Lashas brilliant new airport (Huge Chinese letters were being erected on its roof) and immediately went through many courteous inspections by military (many young women) and immigrations. I tried to keep my peace and endure. Everyone was treated equally although our Sherpa companions had their backpacks inspected. The airport and the whole outside were impressive. And our guide and drivers met us with welcoming white silk scarves. Here one says Tashe-Deley. 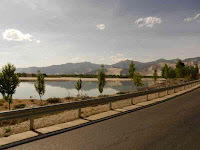 We took off for a long drive through the valley - lined with poplar and willow trees which are being planted by the thousands to help hold the sand down along the river. Barley (used to make chang or beer) and peas are farmed prodigiously here. 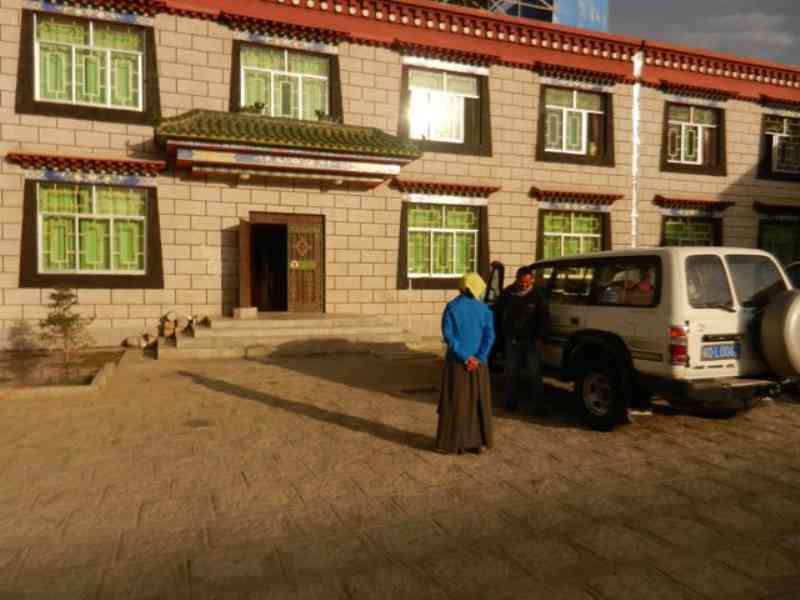 Everyone lives in identical large block homes with prayer flags on poles on the roof. Hairy Yaks, Zos (a cow-yak mixture) shaggy sheep and long haired goats are also residents. Nothing is crowded. It's full of space and order. 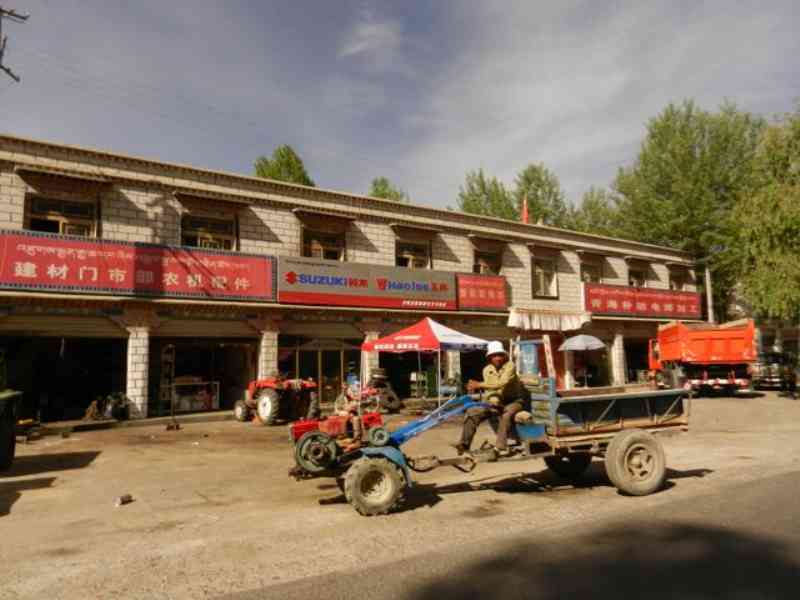 Cars, trucks and farm equipment are top of the line but one gets a bit dizzy not only from the altitude (about 12,000 ft) but from the constant horn tooting. If there is someone walking alongside the road, toot. If a car is coming, toot, as if they don't see you. Anything that you think could be an obstacle, toot. Sigh. Once you are in Tibet, Yaks reign. 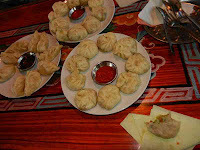 Not only are they transport animals, but Tibetan food is primarily Yak meat, milk, cheese (not a happy taste) and butter. There is butter tea but butter is the primary offering Buddhist bring to the temples - to keep the candles lit. The original Tibetan religion, Bonism, who believed that all life started from eggs, considered the white yak (haven't seen one) as a diety. 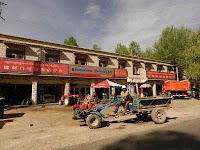 Our destination for the first night in Tibet was Ganden, home of the most ancient of Buddhist monasteries. When we reached the small town - clean and active but not crowded...we were to dine at Tashi Restaurant - which caters to tourist. But, irritatingly, no matter what restaurant, it's up two or three flights of not so happy stairs. Then dare to stop at the restroom??? a flimsy curtain for a door, a hole for the waste and the low window opened so anyone down below could see your squat. Good heavens. Here we go out of my comfort zone again. I remember it well from trekking to Everest base camp four years ago. Of course, I was woozy and dizzy at the top - a normal reaction after sitting in a car for 3 hours - windows opened so the fresh air blows in - and at a new high elevation. 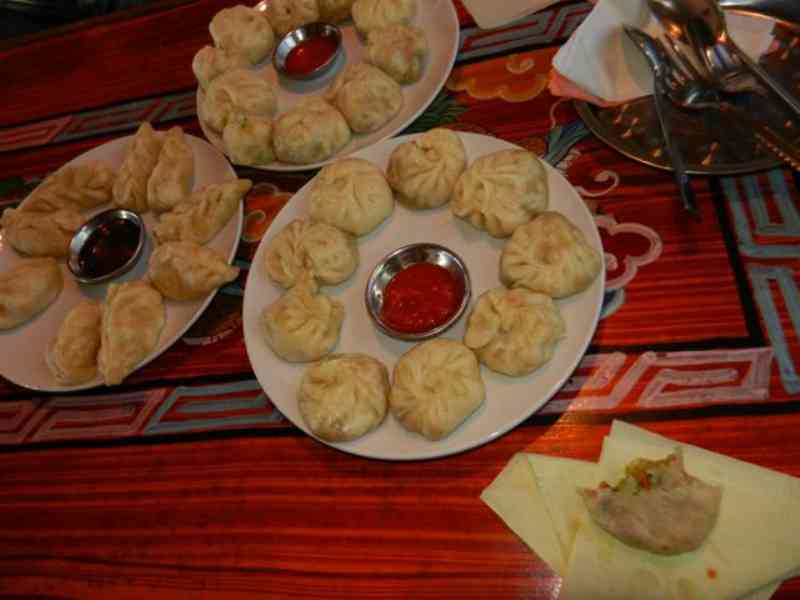 But I ate my favorite vegetarian momos and Tibetan bread (a fry bread). It was dark when we finished and finally got to the guest house. It's a two story square building around an opening into which you drive and leave your vehicle. The young girls attending us (don't think they expected such heavy bags) proudly showed off their 24 hour hot showers in the rooms. Ha. Not on my life. There was a TV - six Chinese channels. So I watched a DVD on my laptop and hoped to sleep. It was dark outside. Really dark. And quiet. Tomorrow the Tibetan adventure begins. Audrey, Wish I was with you on your adventure but this is the next best way to follow. I love your wonderful descriptions and musings and look forward to the next. Godspeed and joyous travels. Come home safe.